In August 1998 Stephen King did a reading at London’s Royal Festival Hall. This was the first time he had ever done a reading in the UK and I am not sure if he has done one since, what I do know is that the evening was a sellout. The story King read that night was “L.T.’s Theory of Pets”. At that time the story had never been released in the UK, although it was included in King’s short story collection Six Stories which was published in 1977 as a limited edition by Philtrum Press. The story was later included in King’s anthology Everything’s Eventual, published in 2002. After finishing reading his story King took a break and then returned to the stage for an interview with Muriel Gray. The interview is also included in the audiobook, which has a total runtime of an hour and thirty-five minutes. That’s about fifty-five minutes of story and forty minutes of interview. King’s initial intention had been to write a funny story that was also rather rude and about what would happen if two people bought each other pets as gifts and then those pets bonded with the wrong partner. “L.T.’s Theory of Pets” is certainly funny and it is also a little rude in places, but it also has a dark side because King ended up including an axe man in the mix. “L.T.’s Theory of Pets” is told in the first person, from the perspective of a working-class man who, like his friend L.T., is employed by the local meat packing plant. L.T. is a chatty kind of guy and a born story-teller who often has his workmates rolling around the loading dock with laughter when he recalls the day his wife Lulubelle left him, taking with her the dog that she bought for him as a present on their first wedding anniversary, but leaving behind the Siamese cat that he bought for her on their second wedding anniversary. L.T. always ends the story with his theory of pets. It is such a funny story that the guys who have heard it before laugh every bit as hard as the new guys who are hearing it for the first time. There is another part to the story though and L.T. hardly ever mentions that at all because what happened to Lulubelle—or may have happened to her—after she left him is not funny at all. 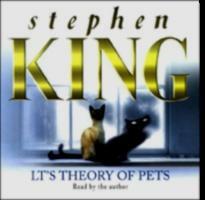 Apart from everything else “L.T.’s Theory of Pets” is also quite a sad story because L.T. really did love his wife and the truth is that, even while he is entertaining his colleagues with his story and rolling his eyes at all the right moments, he probably loves her still. I found the line about L.T. eating his sandwiches—the sandwiches that he made himself—particularly poignant. It paints the picture of a man who is alone. Except for his cat Screw Lucy of course. Stephen King does an excellent job of telling this story. I was already familiar with the story from the book Everything’s Eventual, but to hear King read it himself is something else. He puts a lot of emotion into it and really brings it to life. Plus, it’s hard not to like the voices he gives to L.T. and Lulubelle. The interview section of this audiobook is equally good. King and Gray talk very easily together, there seems to be a real rapport between the two, and King has Gray screeching with laughter on more than one occasion before they are finished. King is obviously joking about the Alzheimer’s but he does answer a more serious health-related question later on when Muriel asks him about the eye disease macular degeneration. Many other subjects are touched on in the interview, including life after death and King’s opinion of Stanley Kubrick’s film version of The Shining. When I bought this audiobook I never realized that the interview was included and so, for me, it was a very welcome bonus.